SEARCHING FOR A RELIABLE CHAIN-LINK FENCING SERVICE? Over the last decade, there has been immense growth and competition within the property maintenance industry. Fence installation, in particular, has experienced an influx of companies offering various styles and options. How do you decide what kind of fence is ideal for your project? A Fence Utah can help you find the right solution. As a professional chain link fencing installation company, we also offer a wide range of custom fencing styles and options. Depending on the kind of project you are undertaking, we can help you narrow your choices down. 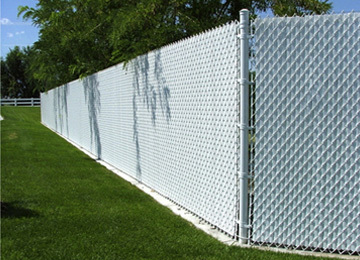 Among the many products we offer is chain-link fencing. Admittedly, chain-link fences are among the less aesthetically appealing fencing styles available on the market. Nevertheless chain-link fences continue to be a hugely popular style owing to their immense strength and durability. If you are managing a project and fear trespassers and squatters, chain-link fencing is the ideal option for you. Talk to us about your requirements, and our experts will give you solid, unbiased advice. Can help you protect your property from strangers as well as wild animals. Are extremely sturdy and resistant to impact. Can be made in custom sizes depending on your preferences and requirements. Are one of the most cost-effective fencing styles we have on offer. As you can see our fencing solutions tick all the right boxes! A Fence Utah is among the most elite professional fence installation companies in Utah. We undertake new installation projects of all sizes – domestic or commercial. We believe in creating long-lasting relationships with clients, If you are looking for an affordable and trust-worthy fence installation service, get in touch with us at the earliest.